An American favorite ever since its introduction in 1936, the Acrosonic is true to its name which means "Supreme Sound." It features a full-sized professional action, solid spruce tapered soundboard, 19 ply pinblock, time-honored sandcast plate, and the legendary patented Baldwin Syncrotone II Bass Strings. Pictured in elegant dark mahogany satin. The carefully designed geometry of the Acrosonic's Full Blow™ Direct Stealth Action delivers an exceptionally responsive touch. The keys are also made from solid spruce and are individually weighted. All of the corners of the keys are rounded and polished for an elegant, sophisticated look. 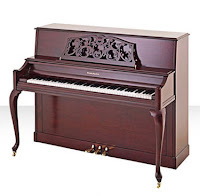 The keys are also covered with a special coating that resists stains and chipping. The multi-ply pinblock is a variation of the one from Baldwin’s legendary concert grand pianos, and is constructed from premium hard rock maple and delivers unmatched tuning stability. Whether you’re a student, teacher or professional, the highly responsive action and note-for-note clarity of the Acrosonic makes it a natural – and desirable – choice for players of all levels. 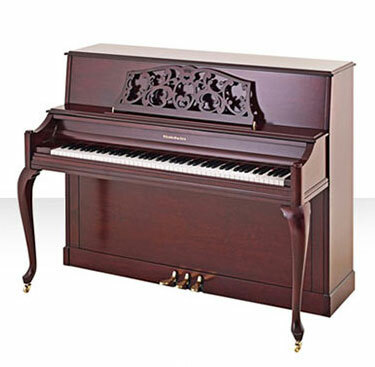 The Acrosonic 2096 is available in Satin Mahogany finish. Click here to visit the official manufacturer's product page for more info!